Hypnotherapy Stoptober is Here – Are You Ready To Quit? On the first of October, smokers all over the UK will pledge to quit smoking for the month of October. Reportedly, in 2013 over 250,000 people took part in Stoptober and over 65% of those who took part reached the 28 day mark. It is not known how many of those people actually stopped for good. According to Public Health England if you stop smoking for 28 days you are 5 times more likely to stop for good. 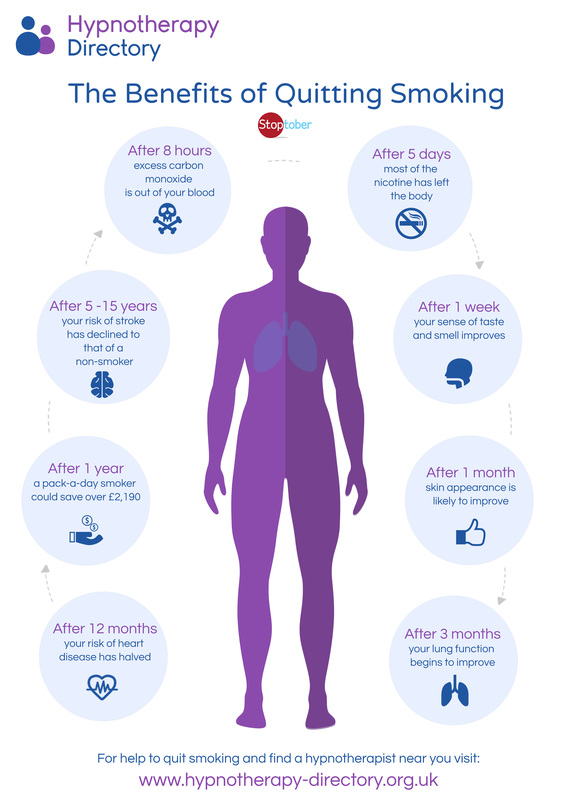 The reason for this is because within hours the nicotine begins to leave the body. Withing five days it has gone completely, see chart. So with all nicotine gone from the body for over three weeks why do many of those who quit for 28 days begin smoking again after their 28 day abstinence? One of the reasons is that the campaign itself which is aimed at stopping for one month or 28 days. Those taking part are often telling themselves things like, “Just a few more days and then I can have a cigarette.” They may be doing quite well but only because they are promising themselves the reward at the end. This is similar to boarding a long flight to Australia for instance and being able to keep cravings in check all the way through the flight by promising the reward at the end of the flight. On long flights the cravings don’t usually become strong until an hour or two before touchdown when the smoker begins to anticipate the smoke. Of course, some people will stop for good and they are generally those who tell themselves things like, “I’ve gone this long so I can carry on without them now.” However, even they may give in and begin smoking again when the first crisis happens in their lives as, in general, they will still associate a cigarette with stress relief. The most successful way to stop smoking is hypnotherapy as it addresses the part of mind where all habitual behavior is contained, in the subconscious. Let’s face it, if stopping smoking was a conscious decision all smokers would find it easy to stop but all habitual behavior is out of conscious awareness. Hypnotherapists know how to access the part of mind where all change begins and that’s why more people stop using hypnosis than in any other way. Hypnotherapy is becoming more popular in aiding smokers to quit. It helps to break the routine and thought patterns surrounding cravings. It can also address the issue of putting on weight after quitting, a common fear of the majority of females. ← Is Smoking Habit or Addiction?